At Saul’s Restaurant and Deli in Berkeley, Calif., the eggs are organic and cage free, and the ground beef in the stuffed cabbage is grass fed. Its owners, Karen Adelman and Peter Levitt, yanked salami from the menu in November, saying that they could no longer in good conscience serve commercial kosher salami. The two are still trying to find, or make, salami that will align with their vision of the deli of the future: individual, sustainable, affordable and ethical. New delis, with small menus, passionate owners and excellent pickles and pastrami, are rising up and rewriting the menu of the traditional Jewish deli, saying that it must change, or die. For some of them, the main drawback is the food itself, not its ideological underpinnings. 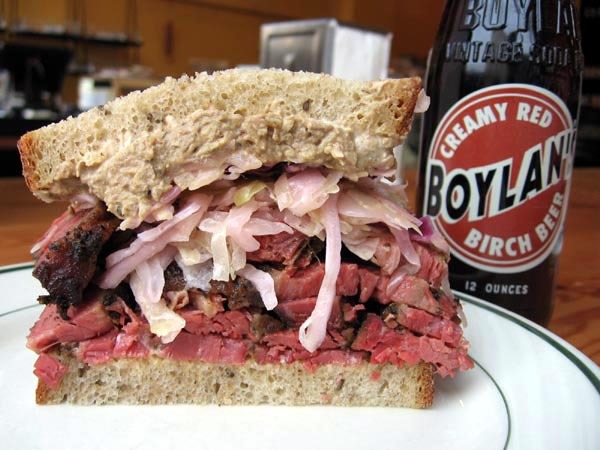 So, places like the three-month-old Mile End in Brooklyn; Caplansky’s in Toronto; Kenny & Zuke’s in Portland, Ore.; and Neal’s Deli in Carrboro, N.C., have responded to the low standard of most deli food — huge sandwiches of indifferent meat, watery chicken soup and menus thick with shtick — by moving toward delicious handmade food with good ingredients served with respect for past and present. The mention of Kenny & Zuke’s caught my eye, since it’s the only deli on the list that is anywhere near us. I immediately went to Kenny & Zuke’s website. One look at the photos and the menu and I was sold. (Pictured above is Ken’s Special: Pastrami, Chopped Liver, Cole Slaw & Russian Dressing.) We have to get down there, the sooner the better. Growing up, I loved chopped liver. I didn’t actually understand that it was liver. I mean, liver was that awful food I couldn’t bear to look at. Chopped liver was, well, I didn’t know what it was, but it was this stuff my grandmother made that I loved. I didn’t eat it as a sandwich –I’d put it on Ritz crackers. And it was sublime. Later, I would have it at delis as a sandwich. In contrast, I didn’t eat pastrami as a kid. My preferred deli meats were roast beef and salami. I didn’t fall in love with pastrami until my college yeras, when I went up to Yonkers one day to visit my friend Myriam at her father’s house. She brought out some pastrami from the local deli for lunch and I wondered why I had wasted so many years. Then I discovered that one could put the two together: a pastrami and chopped liver combo sandwich! That became my sandwich of choice, especially at a kosher deli on Broadway in Washington Heights, a couple of blocks north of Columbia-Presbyterian Medical Center. Some kosher delis close at Passover, for all the obvious reasons — it’s way too much work to clean the restaurant of all chametz (leavened bread products) and to have kosher-for-Passover plates and utensils. Plus, if you can’t serve bread, what do you do about making sandwiches? Pastrami on matzoh doesn’t work so well. It turns out that my Washington Heights was not one of those wimpy delis that closed on Passover. They had a solution to the sandwich problem: potato pancakes! They would slice a potato pancake in half to produce two thin pancake slivers and use these as the top and bottom halves of a sandwich. Inspired. A revelation. And it meant that I could put three of my favorite foods together — chopped liver, pastrami, and potato pancakes. Now that was good. I bet they don’t do that at Kenny & Zuke’s. Maybe I could ask.